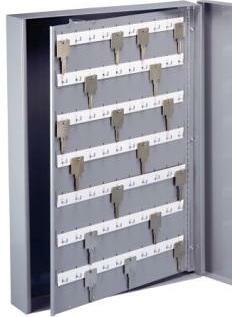 The Lund Big Head Key Cabinet has been developed for large/big head keys like Do Not Duplicate key or hotel key tags. However, it is not suitable for the new remote access key systems used in many new cars. Please see the Lund Automotive Key Cabinet if you need to store this type of key. This premium quality, heavy duty (18 gauge steel), wall mount key cabinet has hooks instead of slotted key tags to accommodate thicker keys and those with large heads. The rows on the panels are configured with a generous 1-1/2" horizontal spacing between hooks and each of the key hooks is a full 5/8" in length allowing each hook to hold up to 6 keys. This Lund Key Cabinet is constructed of heavy duty 18 gauge steel that is welded for strength and features a baked-on enamel finish. The cabinet is designed to stand up to regular daily use. 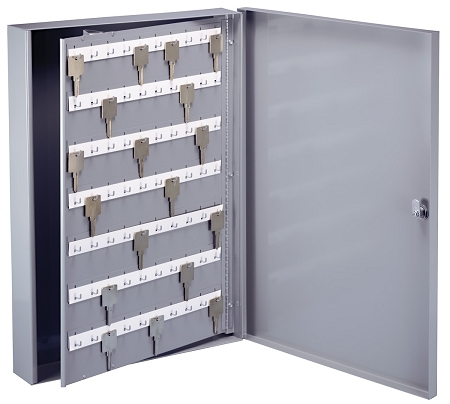 The key cabinet has a cam key lock with 2 keys and interior hinged panel as shown. Comes with unnumbered key hook labels.